This article first appeared on Analyse Opinion Critique and has been translated from French by David Broder. There are certainly many causes of suffering. But suffering is one thing, no longer suffering is quite another. It is even the opposite. Yet the aspects of suffering that are listed to explain the revolt could be equally adduced to explain its absence: individuals subjected to such conditions of existence do not normally have the time or energy to revolt. This movement that has surprised all expectations has no other reasons than those that feed the normal order of things. The reasons behind it were also reasons for immobility. Explanations of why people move are equally explanations of why they do not move. This is not a simple inconsistency, rather the very logic of explanatory reason. Nothing has happened that was not already known, which leads those leaning politically to the right to conclude that this movement had no reason to exist, and those leaning to the left to conclude that it is entirely justified – but unfortunately has taken place at a bad time and is led by the wrong people in the wrong way. As always, there are the same two schools: those who don’t know why people are moving and those who know on their behalf. Sometimes we should look at things the other way round: starting precisely from the fact that those who revolt have no more reason to do so than not do so – and often even a little less reason. And from this starting point, seek out not the reasons that enable us to bring order to this disorder but rather what this disorder tells us about the dominant order of things and the order of explanations that normally accompanies it. More than any other movement in recent years, the gilets jaunes movement is the act of people who normally do not move: not representatives of defined social classes or groups known for their traditions of struggle. Middle-aged men and women, like those we meet every day in the street or along the roads, on construction sites and in car parks, their only distinctive sign an accessory that every motorist is required to possess. What got them going was the most down-to-earth of concerns, the price of fuel: a symbol of this mass devoted to consumption that turns the stomachs of distinguished intellectuals; a symbol also of the normality on which the quiet sleep of our rulers rests: that silent majority, made up of scattered individuals without any form of collective expression, with no other voice or vote than that counted from time to time in opinion polls and electoral results. Revolts do not have reasons; they do however have a logic. And this consists precisely in breaking the frameworks in which the reasons for order and disorder – and the people in a position to judge these – are normally perceived. These frameworks are first and foremost uses of space and time. Significantly, these ‘apolitical’ gilets jaunes, whose extreme ideological diversity has been emphasized, have adopted the form of action of the outraged young people of the ‘squares’ movement, a form that the students in revolt had themselves borrowed from striking workers: occupation. Significantly, these ‘apolitical’ people adopted the form of action of the outraged youth of the ‘squares’ movements, a form that the rebellious students had themselves borrowed from striking workers: occupation. To occupy is to choose to assert one’s presence as a community in struggle, in an ordinary place diverted from its normal use: production, circulation or whatever. The gilets jaunes chose roundabouts, those non-places that anonymous motorists drive around every day. They set up propaganda material and makeshift huts there, just like anonymous groups have done in occupied squares over the past ten years. Occupying also means creating a specific time: a time slowed down in relation to usual activity, and therefore a time removed from the usual order of things; but simultaneously a time accelerated by the dynamics of an activity that forces constant response to challenges for which people are not prepared. This double alteration of time changes the normal speeds of thought and action. At the same time, it transforms the visibility of things and the sense of what is possible. Things that were passively suffered acquire a new visibility as injustice. Rejection of a particular tax becomes awareness of an unjust tax system, then awareness of the global injustice of a world order. When a collective of equals interrupts the normal course of time and begins to pull on a particular thread – today the tax on diesel, in the recent past university selection, pensions, or reform of employment law – the whole tight web of inequalities structuring the global order of a world governed by the law of profit begins to unravel. Two worlds oppose each other, widening the gap between particular demands and the very logic of the movement. The negotiable becomes non-negotiable. Negotiating means sending representatives. 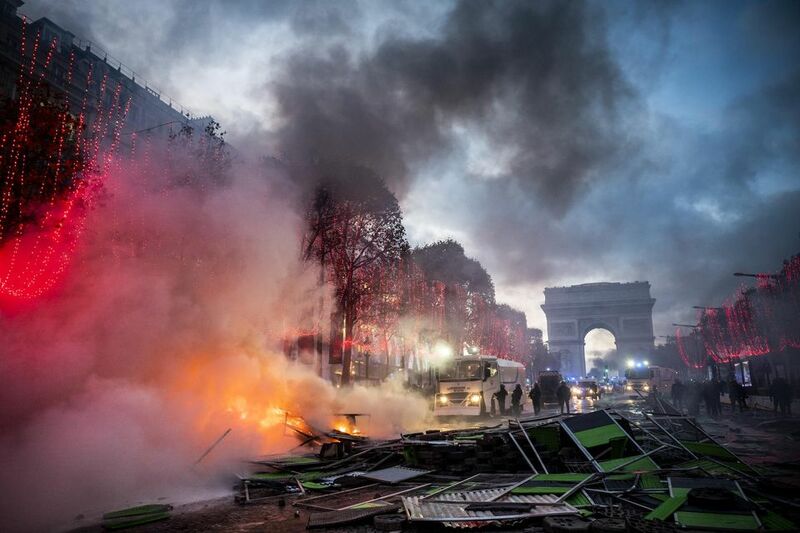 But the gilets jaunes, coming from that France profonde which we are often told is sensitive to the authoritarian sirens of ‘populism’, have adopted the claim of radical horizontality that had been seen as particular to the young romantic anarchists of the Occupy movements and ZADs. There can be no negotiation between the assembled equals and the managers of oligarchic power. This means that a particular claim triumphs simply because of the latter’s fear, but also that its victory is seen as derisory in relation to what the revolt ‘wants’ by its immanent development: an end to the power of ‘representatives’, of those who think and act for others. It is true that this desire can itself take the form of a demand: the famous ‘citizens’ initiative’ referendum. But a reasonable claim like this actually hides the radical opposition between two ideas of democracy. On the one hand, the prevailing oligarchic conception: counting votes for and against in response to a question asked. On the other hand, the democratic conception: collective action that declares and confirms the ability of anyone to formulate questions themselves. Because democracy is not the majority choice of individuals. It is action that implements the capacity of anyone, the capacity of those who have no ‘competence’, to legislate and govern. Between the power of equals and that of people ‘competent’ to govern there may always be clashes, negotiations and compromises. But behind them, there remains the abyss of a non-negotiable relationship between the logic of equality and that of inequality. This is why revolts always get stuck halfway, to the great displeasure or great satisfaction of scholars who declare them doomed to failure because they lack ‘strategy’. But a strategy is only a way of acting within a given world. No strategy teaches us to bridge the gap between two worlds. ‘We’ll go all the way,’ they say every time. But this end of the way is not identifiable with any specific goal, especially since the so-called Communist states drowned revolutionary hope in blood and mud. Perhaps this is how we should understand the slogan of 1968: ‘This is only the beginning, let’s continue the struggle.’ Beginnings do not reach their end. they remain halfway. But this also means that they never stop beginning over again, even if this means that the actors change. This is the realism of revolt, an inexplicable realism, one that demands the impossible. Because the possible has already been removed in the very formula of power: ‘there is no alternative’. The Référendum d’Initiative Citoyenne is the core demand that has emerged from the gilets jaunes movement.